Posted on March 5, 2013 by carriemullaly in Recipes, What's for dinner? 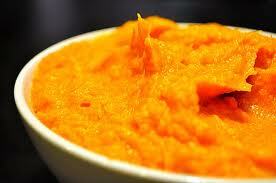 Sweet potatoes are very healthy and great for balancing blood sugar. This is a simple twist to the usual. Peel the potatoes and cut into chunks. Steam them until tender. Add milk and beat with a mixer until light and fluffy. Add sea salt and pepper. Finish with adding fresh green sprouts.